Yes, that’s the title of my blog post. For those unfamiliar with Cheezits, they are highly addictive American crackers that we don’t have in Canada. On Monday my friends and I drove over to the USA to visit the Trollbeads store at Twelve Oaks Mall in Novi, MI and to buy Cheezits. It’s a big deal for us to go to a Trollbeads store as there aren’t any concept stores in Canada and from where I live it’s a two hour drive to get to any store that carries them. By going in the other direction, towards Detroit, we can go to a mall that also has a Williams Sonoma, Vera Bradley and a few other stores we don’t have in Canada. 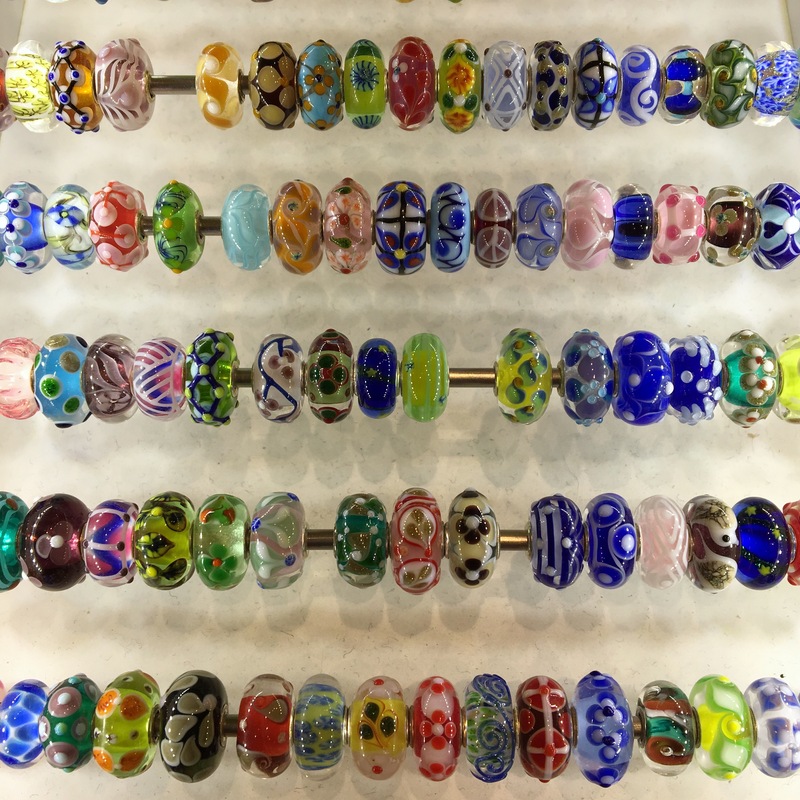 Anyway, what really blew us away at the Trollbeads store was the beautiful displays and the massive amount of Uniques. We had a nice chat with the manager and she let us take our time looking at all the beads. I had some videos and pictures on my Insta Story, but that disappears after 24 hours. Here’s the video of some of the jumbo Uniques. We could have spent the entire afternoon looking at the Uniques. Those who saw my Insta Story know I purchased 4 beads. The first is the jumbo dragonfly Unique that was in the video. I made up a blue bracelet, using the Bumble Bee Spacer and Dancing Butterfly Spacers. A regular size unique I bought has the sweetest little bird! Left to right below are Love & Laughter, Perfect Moments, the unique, Soulmates and Once Upon a Time. I wore it for a couple of days with this buttery amber that I bought. On either end are two Rose Quartz beads. 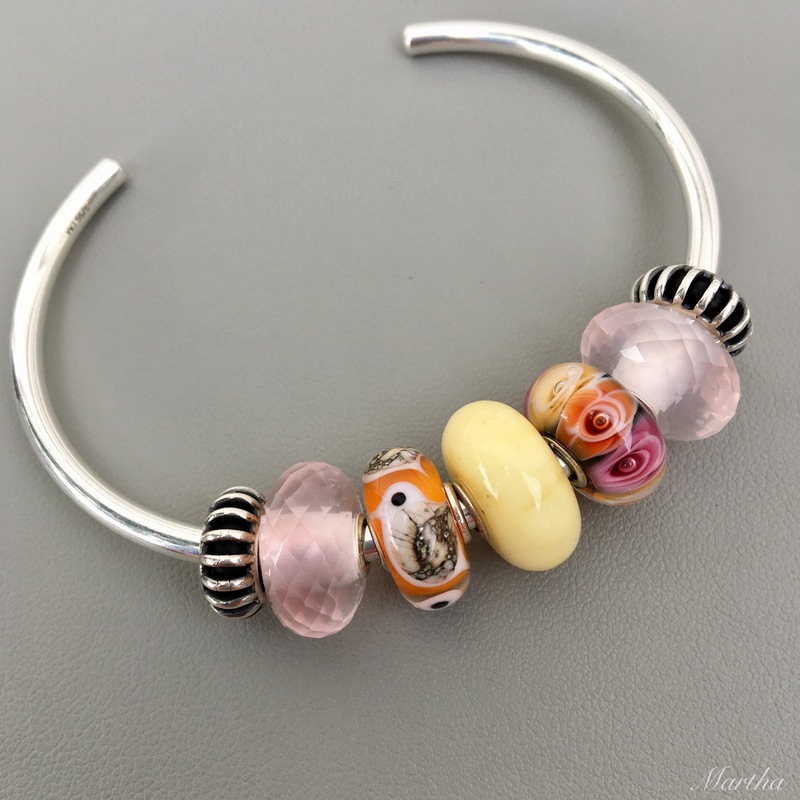 The flowery bead is Roses for Mom. Here is the amber with the Rose Quartzes but with two Gold Silver Traces. 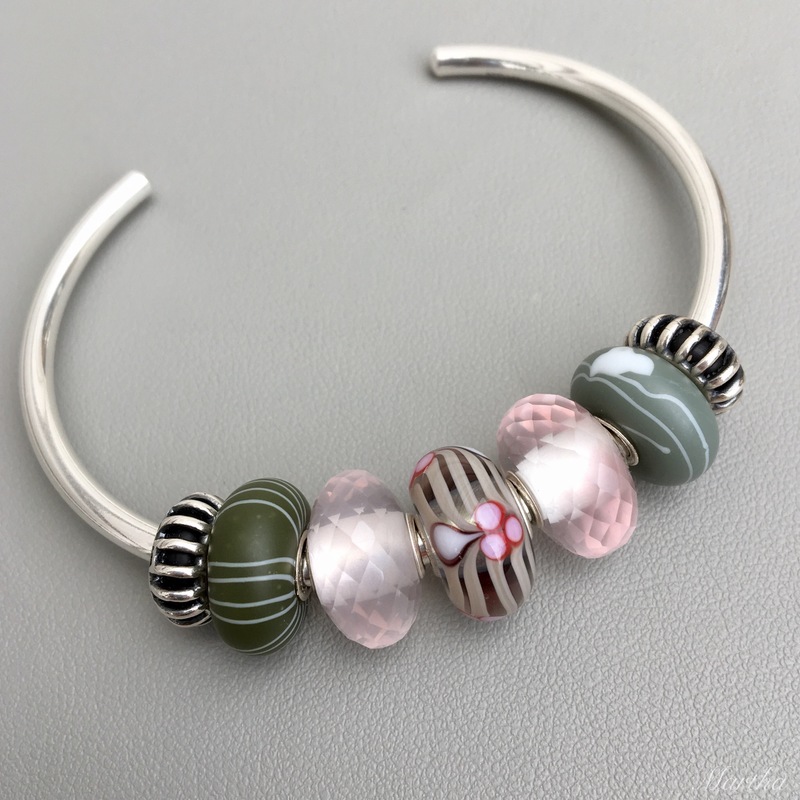 Finally, the fourth bead is another unique. I had no idea what I would do with it, but I just had to have it. I think I’ll be able to find a couple of things to go with it, but for now I’ve put it with two beads from the Kimono Kit and the Rose Quartzes. 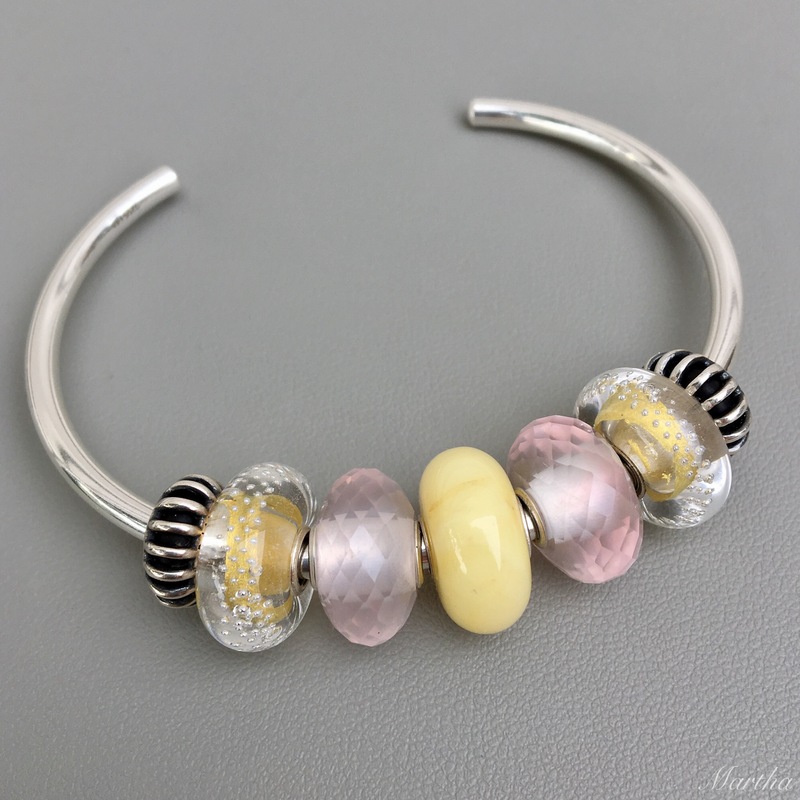 I absolutely love this bangle. Hope you’ve enjoyed this quick look at my purchases! Do you have friends you go bead shopping with or are you alone with your addiction? I know a lot of people on social media say they really wish they had bead friends, so I realize I’m very lucky in that regard! 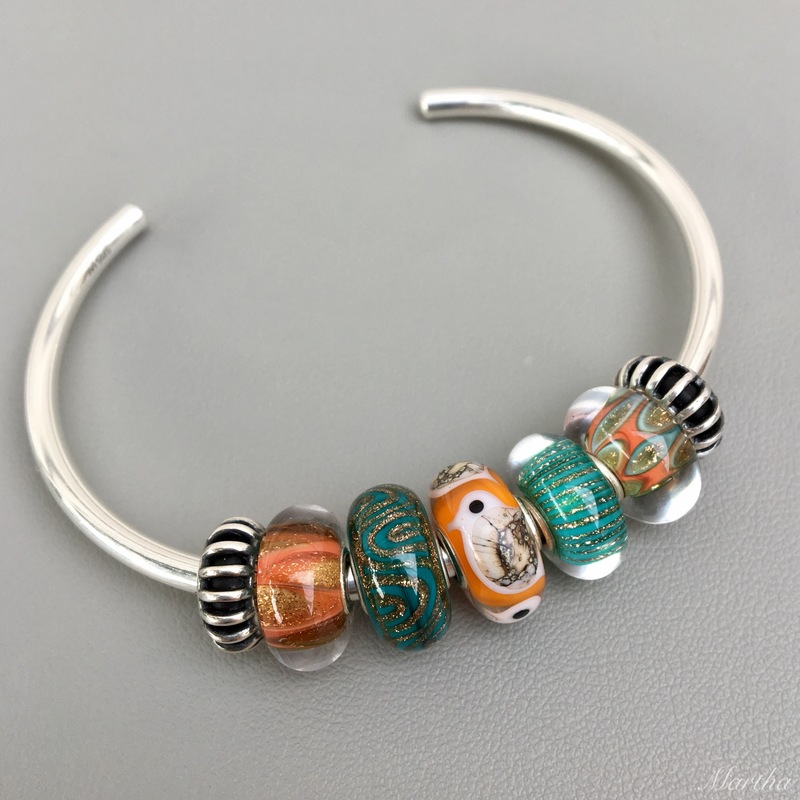 It was fun to read about your bead trip this morning and to get another look at your purchases and how you styled them. The Uniques are all beautiful and your choices are lovely. 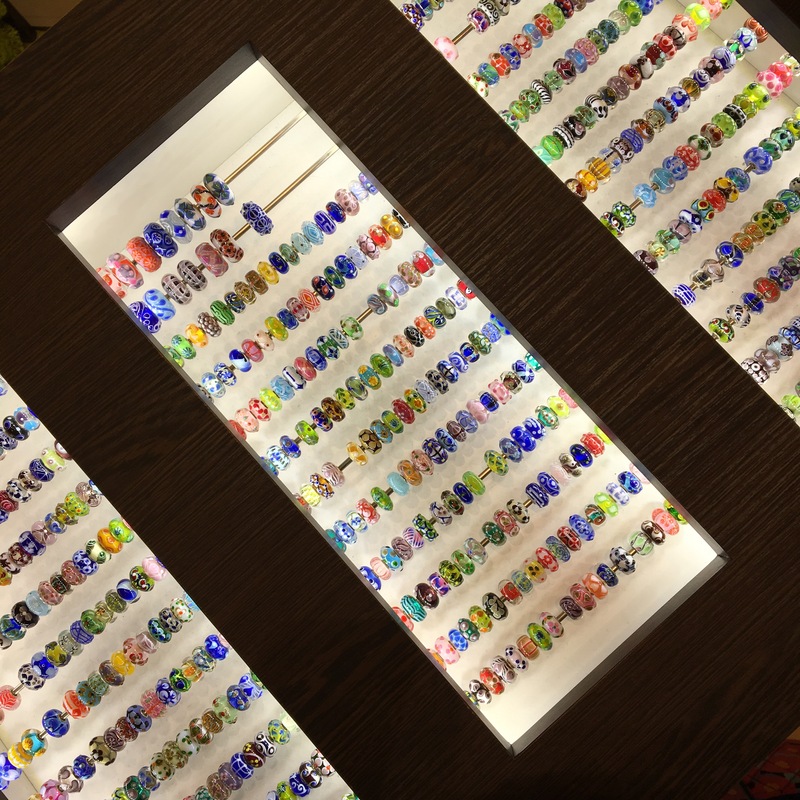 Yes, bead friends are the best, that store was dizzying and I am already planning another trip….so many marvellous beads and so little money. Sigh. It really was dizzying, I so agree. I’m so glad you were able to come along Sarah as it’s always a treat to spend time together! 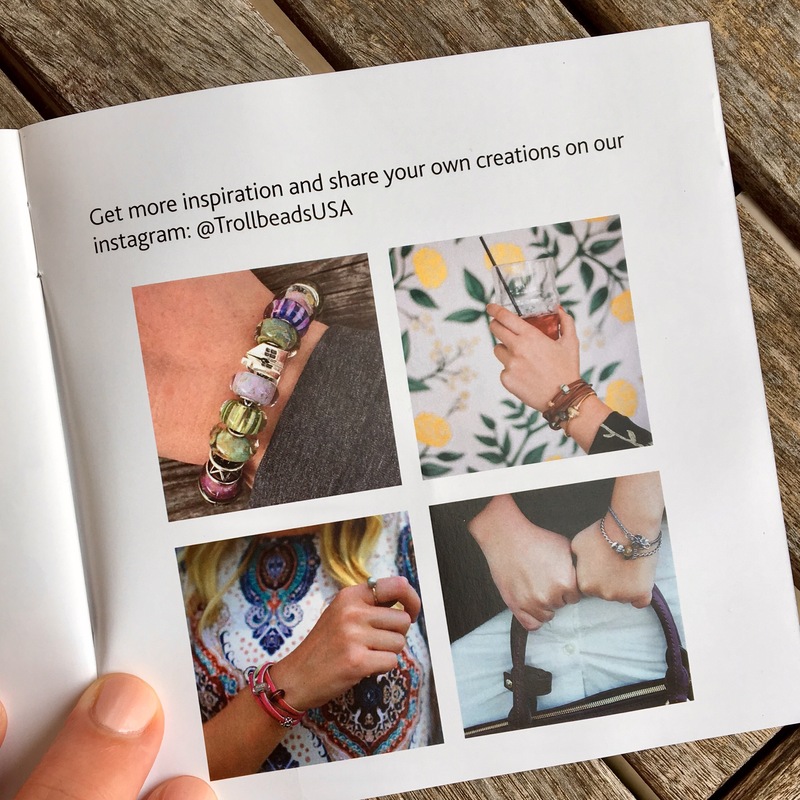 I love it that your wrist made the brochure! Those jumbo Uniques are really something, I don’t think my local retailer has those. I’ll have to ask next time. Does the concept store have chairs and love seats to lounge in while you browse, and coffee? That would be my total dream store! I must do a search to see if there is a concept store in Washington State, we aren’t too far from the border here. I love the blues, and that dragonfly bead is beautiful! I have to say though, the little bird bead is my favourite. There’s just something sweet and compelling about it (it kind of reminds me of the baby partridge from the start of The Partridge Family show!). Thanks for sharing your trip – glad you got stocked up on Cheezits too! Lydia, you are right, the little bird is just like in the Partridge Family! Now I’ll be singing the theme song in my head all day. The store did have a lounging chair and a big book about Trollbeads and there were snacks, too. Have a great weekend! I ❤️ the uniques you chose, especially the bird! I would have probably toiled for a long time trying to choose! The pictures look beautiful and I thoroughly enjoyed touring the sampling of uniques! Hi Martha. I love the Uniques that you got and; as I might have mentioned before, I really, really love that Amber bead! I don’t know anyone personally that likes beads, so when I see one I really like I show it to my son. I don’t feel real enthusiasm from him, but he does takes me to the Pandora store at a nearby mall when I want to go. If we had a Trollbeads store like the one you went to, he could just drop me off and leave me there! I’m glad you had a good time, and now for some reason I feel like going after some Cheezits! I will never take Cheezits for granted again. My pleasure, Cathy! It was a very fun day! You chose some great beads, Martha! I’d almost forgotten how much fun it was to browse through uniques in person. There used to be a few stores in my area that had a good selection, but no longer, alas. And I got tired of the constant hunt for the sought after styles and the price increases too, so I haven’t got any new uniques in a long time. But your post reminds me of how I got hooked on uniques in the first place, and what a thrill it was to find an awesome bead by browsing the trays. 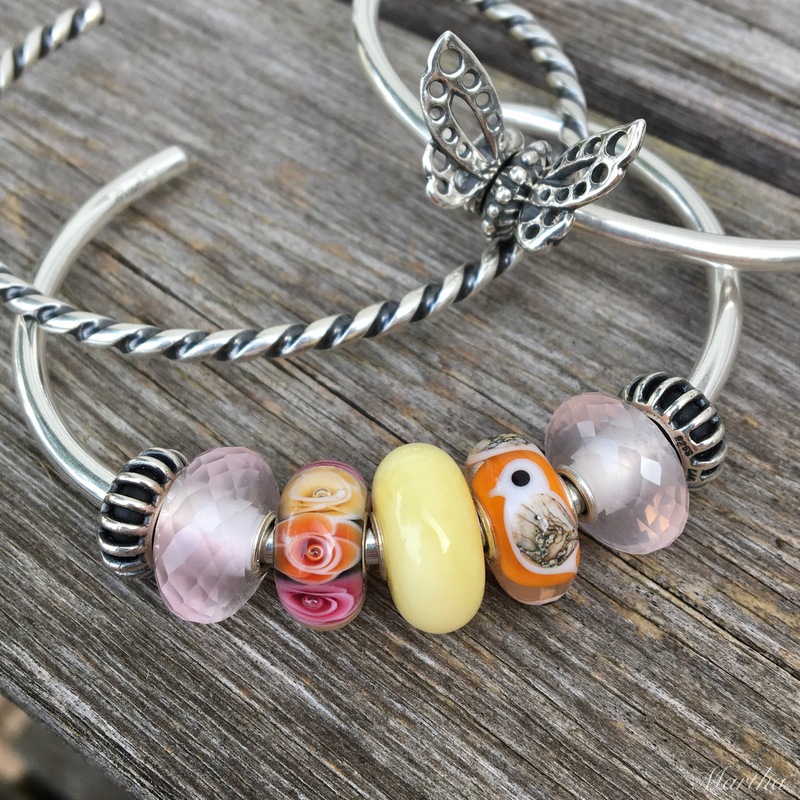 I would sometimes get to go bead shopping with my sister or another friend who collected, and always had a great time – bead shopping is always better with friends! 😊 Did I mention that I love your new beads? Great finds! This is my favorite blog post of all time! The video clip was spectacular… it was almost like being there. No friends for me that are bead collectors but my family are supportive. My sons know most of the Trollbeads by name. And because I chat about the Canadian bead blogger named Martha they are aware of your passion for Cheezits. My sons and husband now refer to you as the Cheezit lady. Hee hee. To be honest I don’t care for Cheezits, but I love your Nestle Coffee Crisp bars esp. Macchiato Caramel variation. I think we need to set up some sort of exchange program. Too funny! I always forget that we have some chocolate that you guys down there don’t have, like Smarties and Coffee Crisps. That’s nice that your family is supportive of your bead collecting. I get eye rolls in this house, but I have my friends, so that’s okay. I’ll take lots of videos at the NYC store next week. I always forget how easy it is for me to put video clips on here (this whole blog is done with my iPhone) but video is a great way to see things. For the Ohm Beads Panoramas I’ve made videos so people can see the beads all the way around. You bought some beautiful beads. I especially love the Jumbo unique with the dragonfly. It’s gorgeous. Unfortunately we don’t have any Trollbeads concept store in France. And the nearest jewellery store that carries the line is 45 minutes away by car. And they don’t have a lot of beads so I only go there when there is a special event. Or if there’s something I really want to try on (like the neck bangle). Almost all my shopping is online. And I’m alone in my addiction. I really wish I had some friends to share it with and to do some shopping. You’re quite lucky. Hi Alexandra, yes, I wish you had some friends who shared your love your beads too. I guess that’s where Instagram is a bit of fun though, as we can all see each other’s combos and new things. That’s great you can try things on at a store, but I know you must be busy so 45 minutes takes a chunk of time out of your day! Hi Martha, The little bird unique is calling me now! I try to say “no”, but it’s not working. Not that I’m blaming you or anything…. 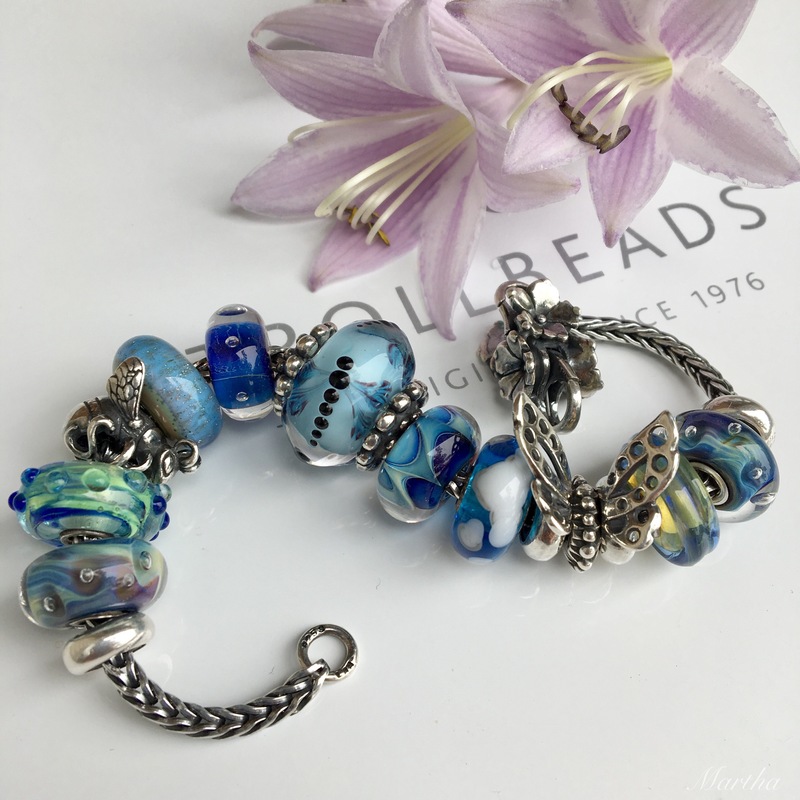 I just bought a purple one from Trollbeads Gallery.